Grant THANK YOU so much for a great fly fishing experience. Andrew and I appreciated Alex and Lopez taking the time to make our trip so enjoyable. We caught a lot of great fish and had them smoked to bring back to Colorado. 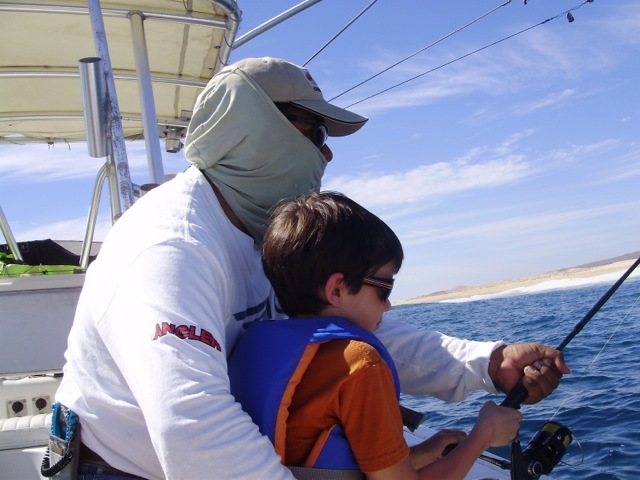 We look forward to another trip to Cabo to fly fish with you in the future. Your crew was great and gave me plenty of chances to catch fish. Very exciting to see them chasing the teaser. Would love to come black. 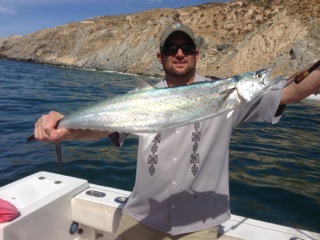 What a beautiful morning with the promise of a good fishing day Man do I love Cabo! 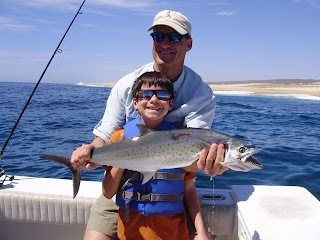 Jennifer and Andrew Jorgensen from Denver Colorado... Jennifer decided to take her 12 yr old son fly fishing while in Cabo... Andrew is a fly fishing nut (which I love to see, wish more kids were into fly fishing instead of X BOX). 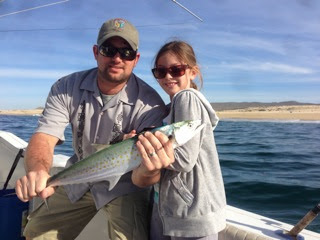 Andrew had fun and hooked and landed some nice fish on his trip, including Sierra Mackerel and Big Eye Jacks...Way to go Andrew! The roosterfish are here and we are catching them on a daily basis, as well as the jacks... They are roosterfish though and dont always cooperate.. Thats why I love them. The offshore fishing is okay right now.. 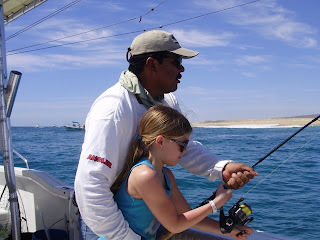 Some marlin and dorado around.. Actually some dorado are close to shore where the roosters and sierra are. Every time I looks at the news I see snow, snow, snow back home. The weather in Cabo is perfect as always,sunny, sunny, sunny and mid 90s. Pictured below is Paul Diefenbach with some sierras on the fly. 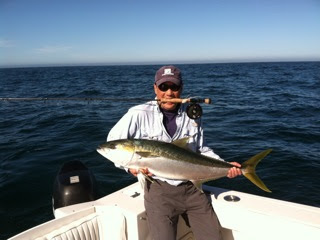 Paul fished yesterday... Way to go Paul. Angus Wilson Roosterfish on the fly It doesn't get better than this! A few days ago, I took Keith Dalton and his family and friends, beach fishing. It was great fun, but a bit slow on the fishing part, so I took them to Cerritos beach. Where Keith's sons and his friends learned to surf and the girls got massages right on the beach. We had a nice lunch and drank a few beers.. It was a great trip and I made good friends.. 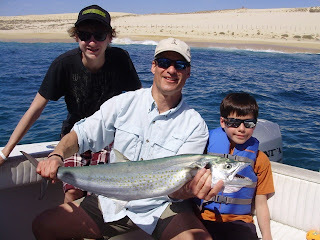 Being a guide, sometimes you feel you should be paying your guests, you are having such a good time......Keith and his family said it was the best fishing trip ever! I am one lucky guy. Thanks Keith for sharing a great day with me. 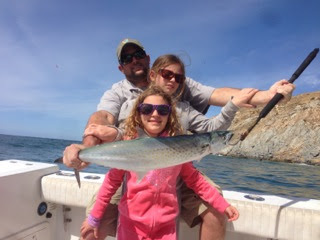 John McCormick and Rich Kruse having fun in Cabo..
Scott Schuster fishing with his two girls 9 yr. old Sadie and 7 yr. old Scarlett. Memories to last a lifetime! Sadie my 9 year old and Scarlett my 7 year old . Sea lion show was great as well ! Rich Sobalvarro just sent me this. The kids had a great time. I thought you might want these of Alex teaching my kids how to handle a saltwater fish. It was pretty funny to watch. The one that I'm holding with both boys they each fought it for a while. It was pretty funny. This is what fishing is all about.. Thanks Rich for sharing. Rich Sobalvarro took his family fishing and they had fun. Nice sierras guys! March 2nd A few photo's form Arturo's camera.